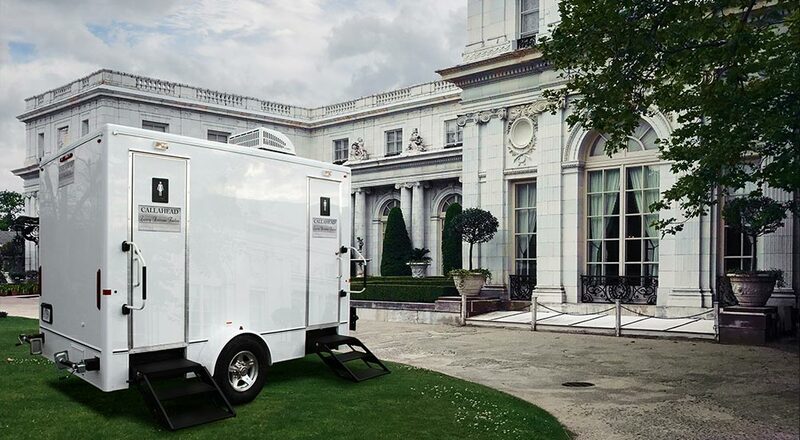 The exterior of the ROSECLIFF is bright white with outdoor lighting for evening events. 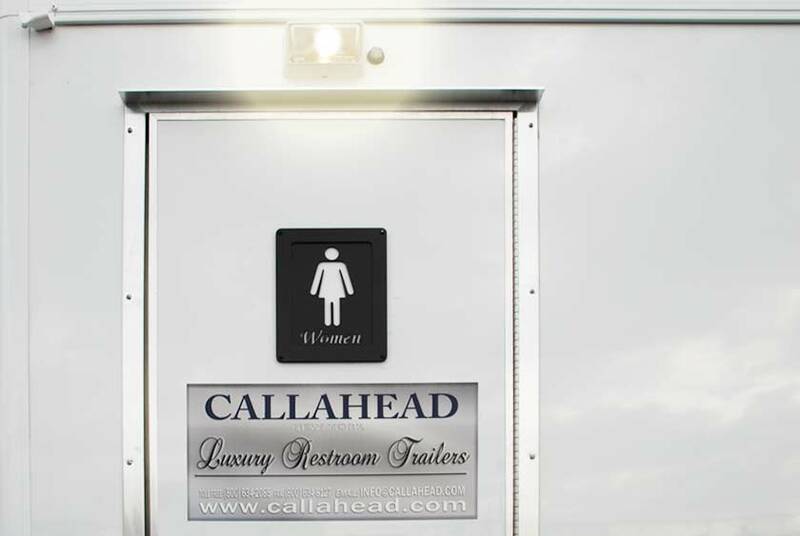 The restrooms are gender marked on the outside doors and include CALLAHEAD Luxury Restroom Trailer’s signature signage. 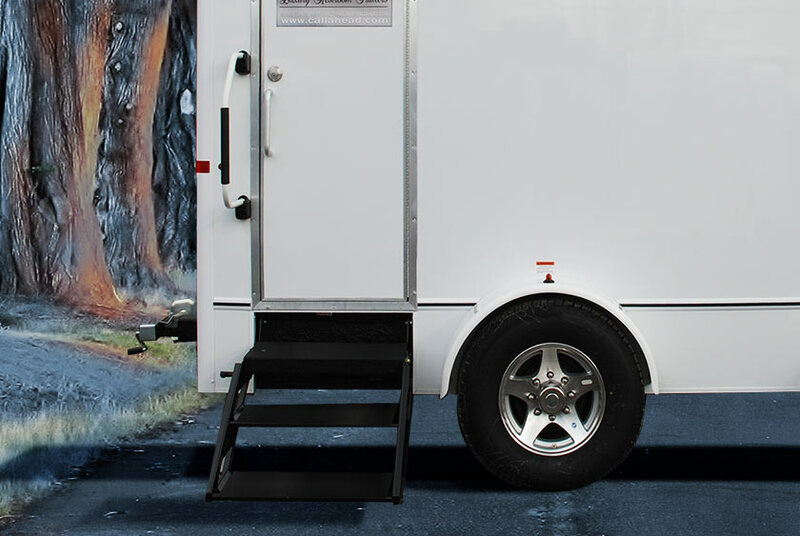 Guests will conveniently enter the restrooms using the wide floating staircase with aluminum handrails. Inside the ROSECLIFF the decorative details are quite extensive and impressive. 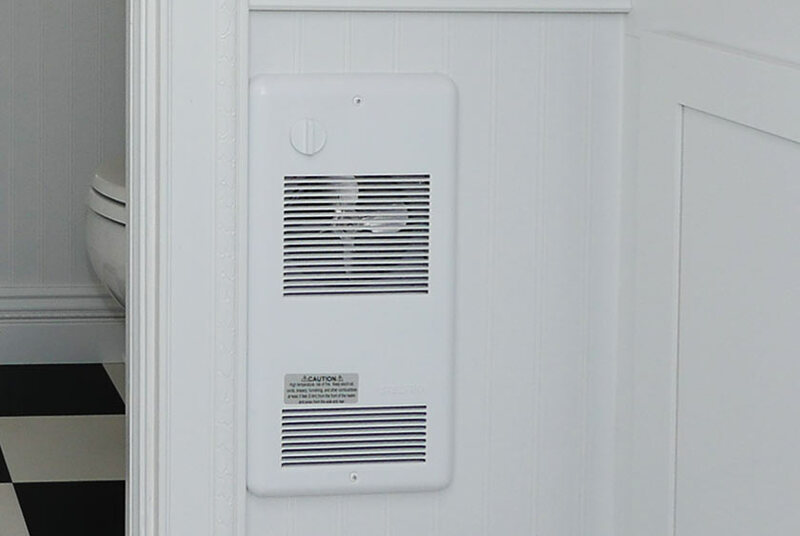 There is white painted wood wainscoting up to the 3-foot height. 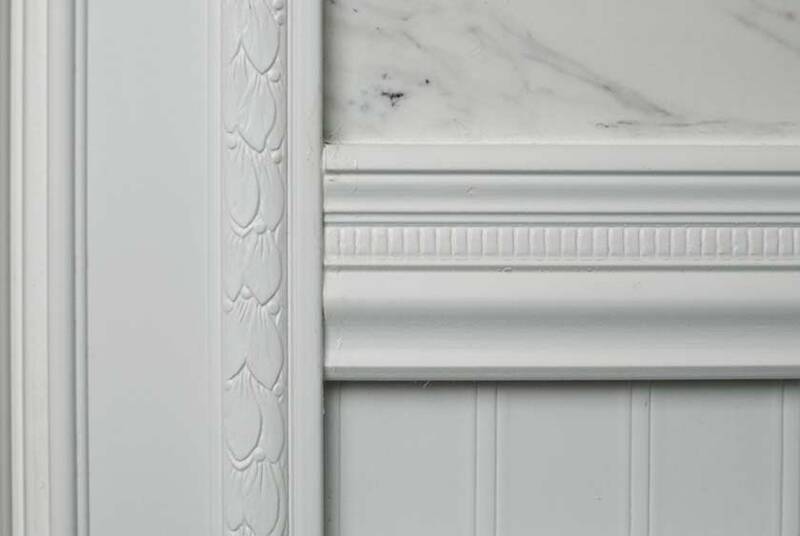 Faux statuary marble walls extend from the chair rail moldings up to the ceilings crown moldings with dental work. 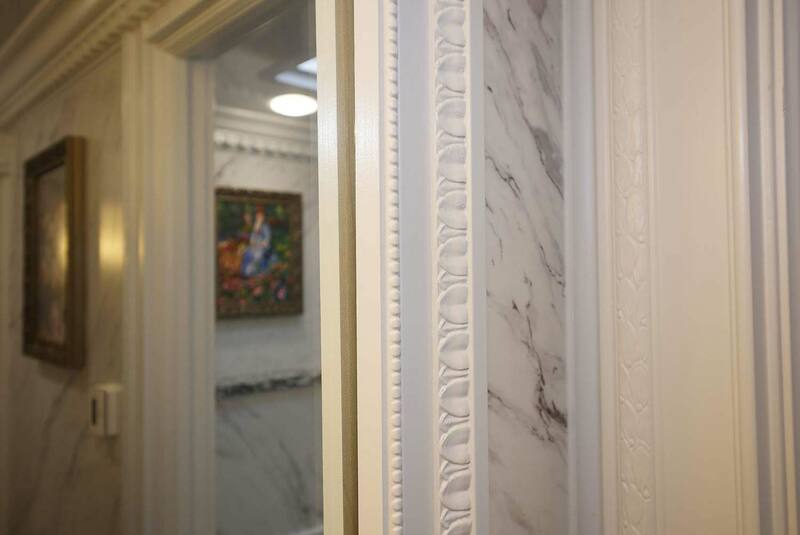 The architectural details continue with large casement moldings around the doors plus a frieze molding above each door, vanity and full-length mirrors. 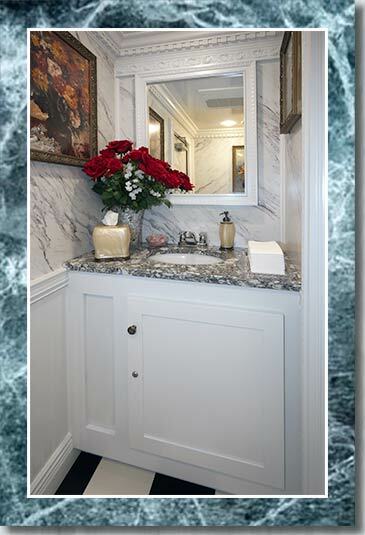 Elegant gold framed art was specially selected and custom framed for the ROSECLIFF Luxury Restroom Trailer. Francoise wall sconces in burnished brass with ribbed glass shades also decorate the restrooms walls. 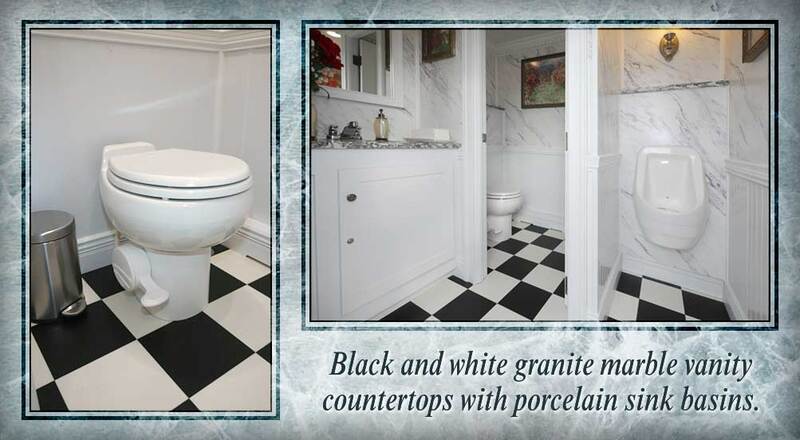 The black and white checkered Armstrong flooring is a perfect addition to the ROSECLIFF’s design. 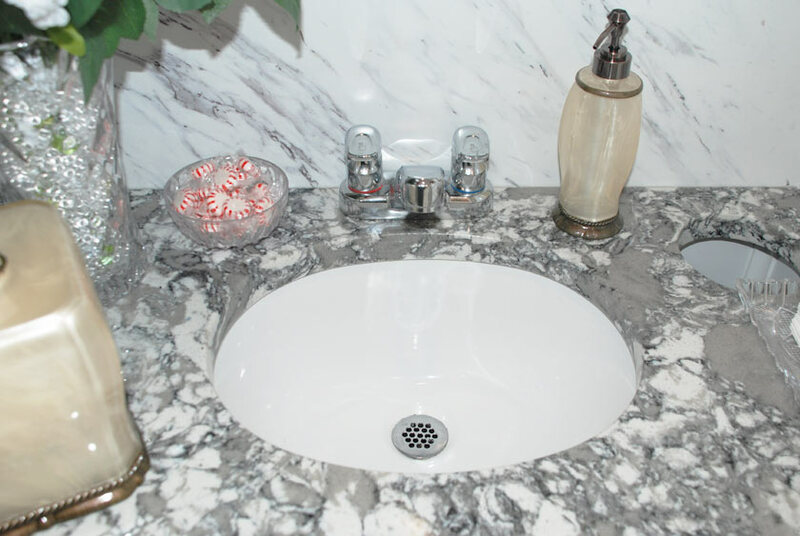 The black and white granite marble vanity countertops have a porcelain sink basin with Moen automatic faucets that supply hot and cold water options. 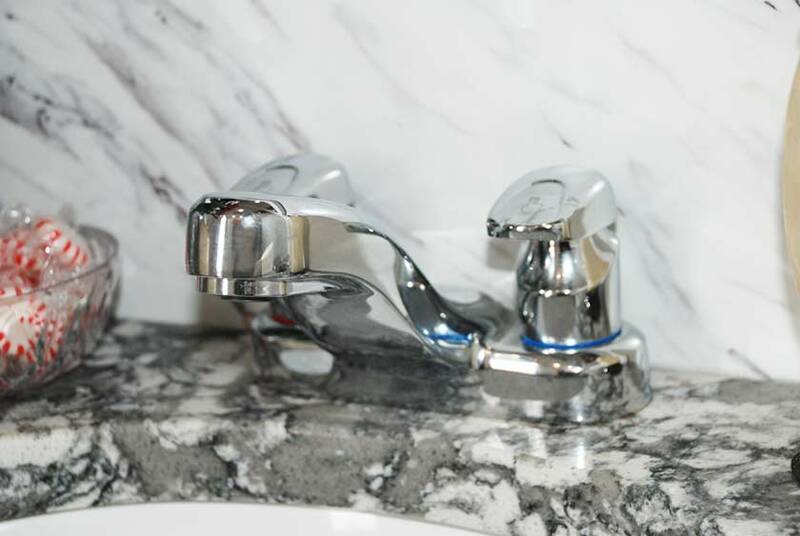 Decorative antibacterial soap dispensers, hand towels, and filled candy dishes are also available. A storage cabinet below the sink is available to store extra supplies. The storage cabinet’s wood door includes a Ribbon & Reed cabinet knob. 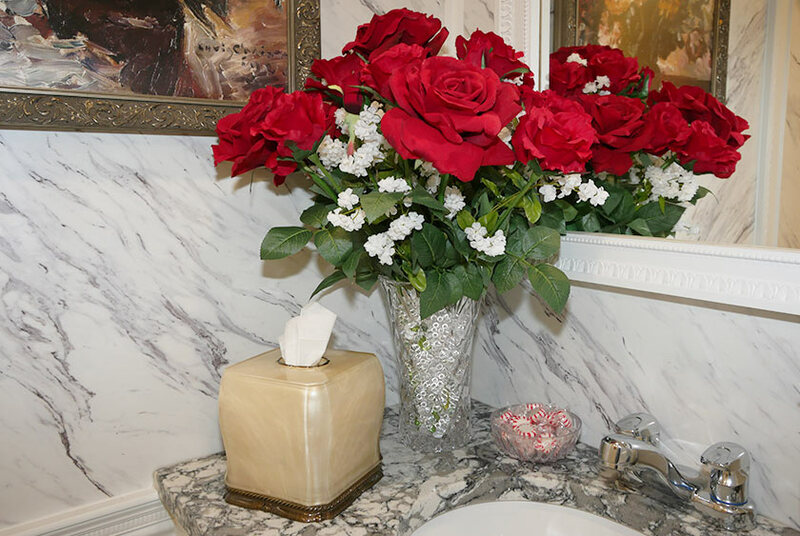 Above the sink, there is a gorgeous wood trim vanity mirror and a floral arrangement that adds even more opulence to the restrooms setting. 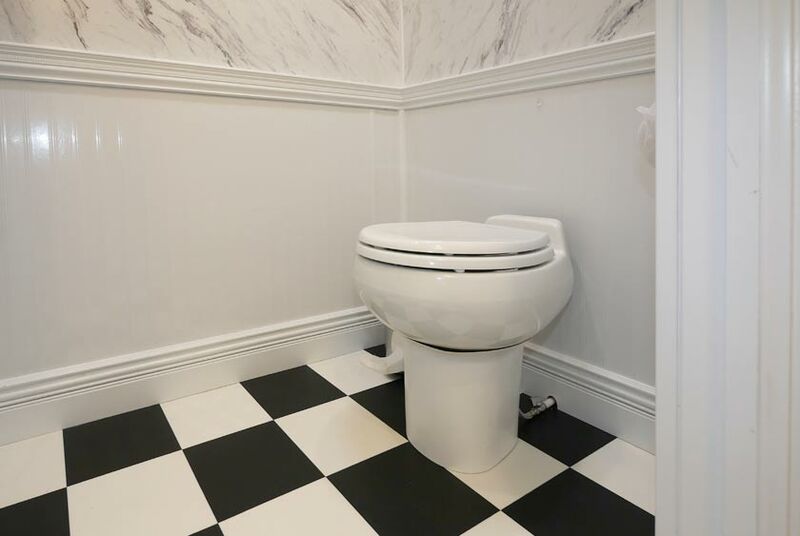 The women’s restroom inside the ROSECLIFF includes a very spacious private bathroom stall with a floor to ceiling lockable wood door. 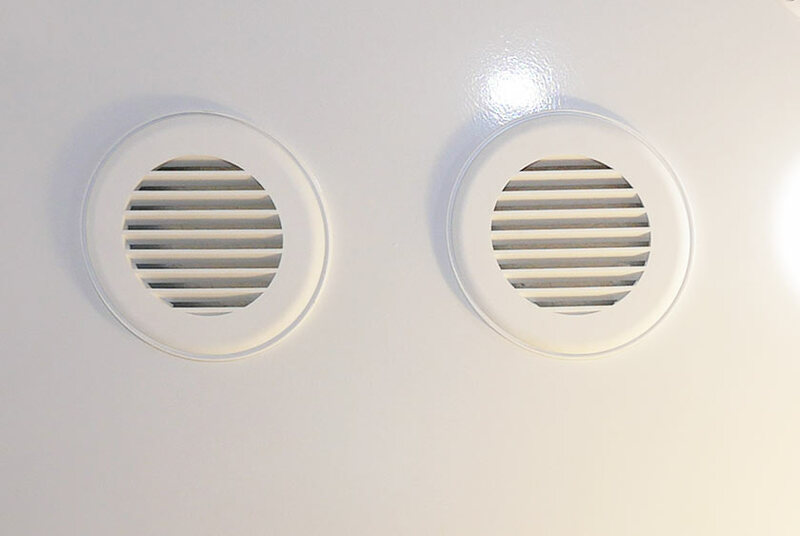 The stall door is decorated with a horizontal recessed panel and two vertical recessed panels all with rope trim work. 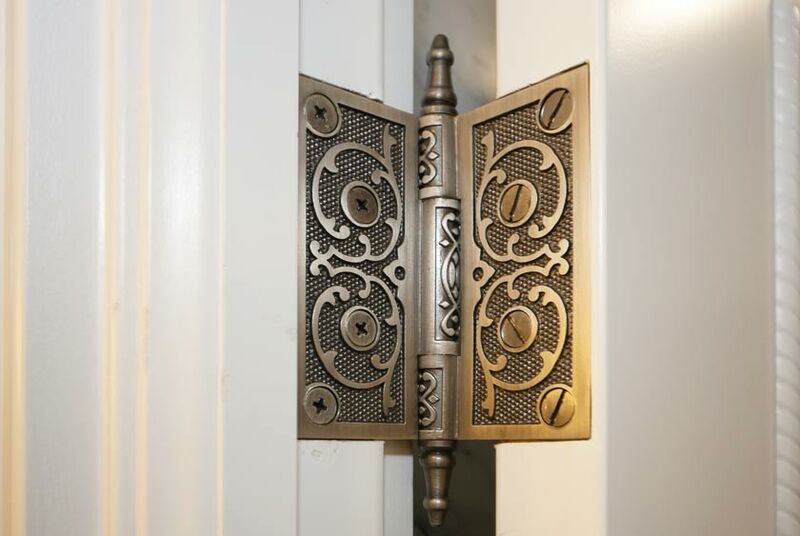 There are also 4” steeple hinges in a decorative vine pattern on the stall door. 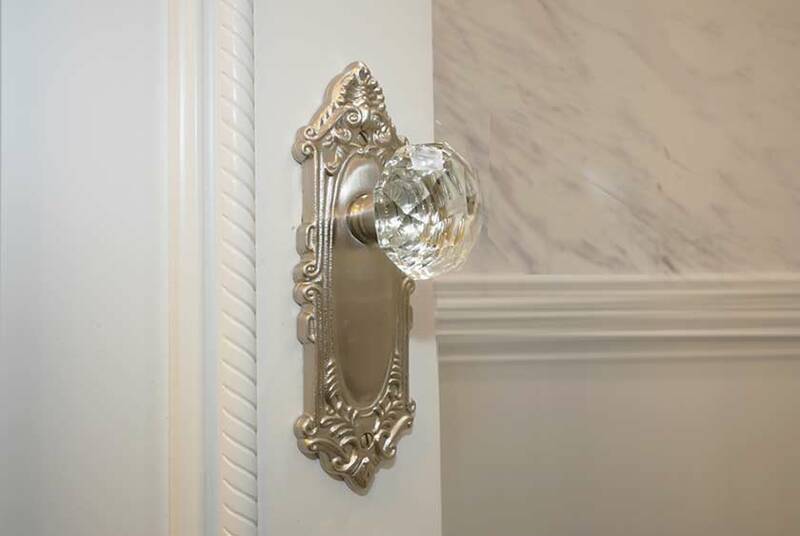 The door handle is a Largo design door set with a diamond crystal glass knob. 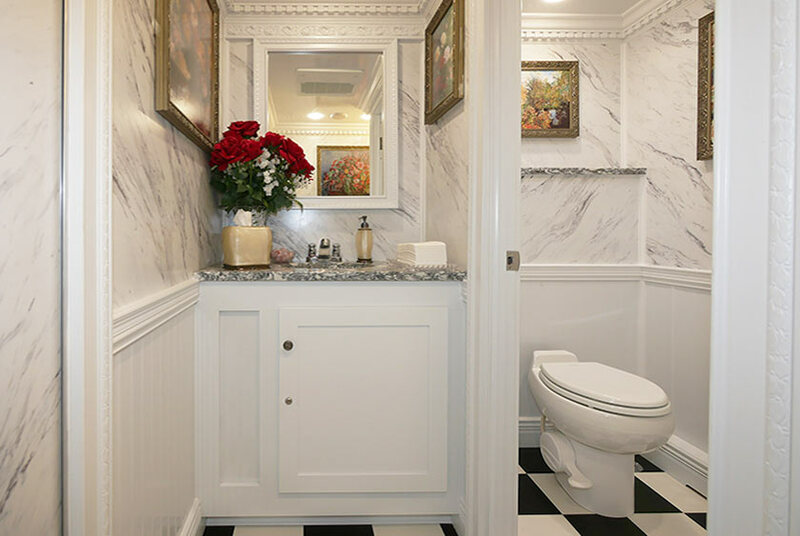 The women’s private stall includes a porcelain hands-free flush toilet, a brass swinging toilet paper holder and a brass double coat and hat hook with Lancaster rosettes, a trash receptacle, and ceiling vent. Custom framed artwork also decorate the walls of the women’s private stall. 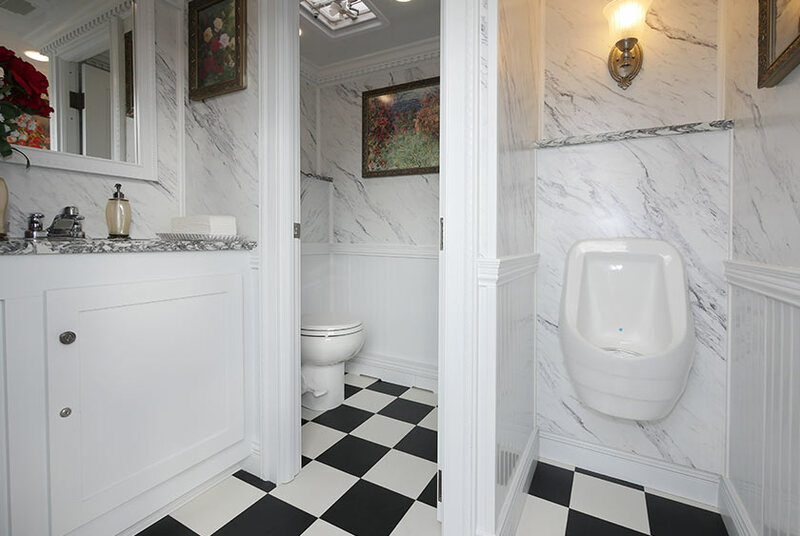 The men’s restroom inside the ROSECLIFF Luxury Restroom Trailer has all the elegant details, amenities and décor as the women’s restroom. Custom framed artwork, beautiful floral arrangement, designer soap dispenser, hand towels, and filled candy dish are all provided. The men’s room also has a large private stall identical to the women’s stall. A Sloan porcelain waterless urinal is also available inside the men’s restroom. 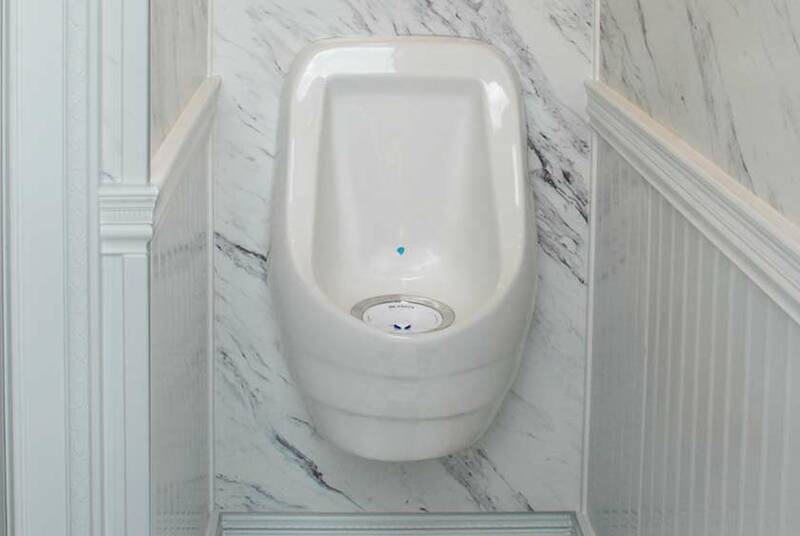 The men’s urinal includes walls on three sides for privacy. 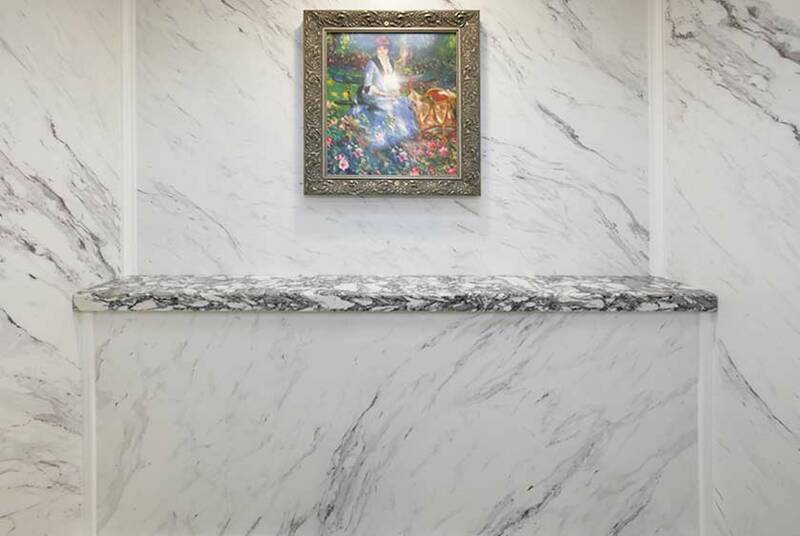 Above the urinal, there is artwork and a black and white marble shelving area for convenience. 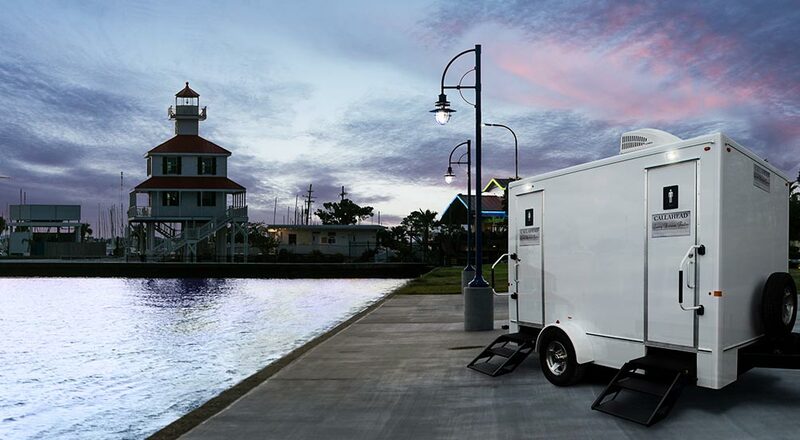 The ROSECLIFF Luxury Restroom Trailer’s thermostat heat and air conditioning will provide a comfortable bathroom experience all year. 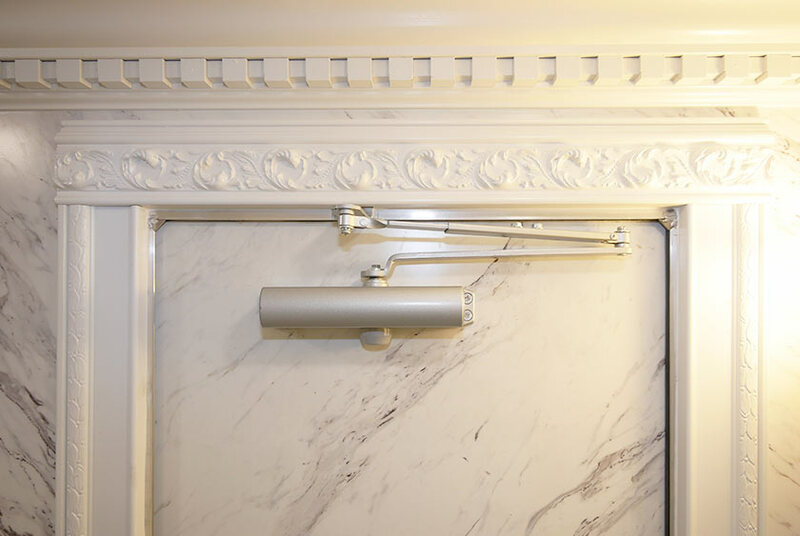 During the bitterly cold New York winters, the ROSECLIFF’s 1500 watt fan-forced heaters ensure warmth inside the restrooms. 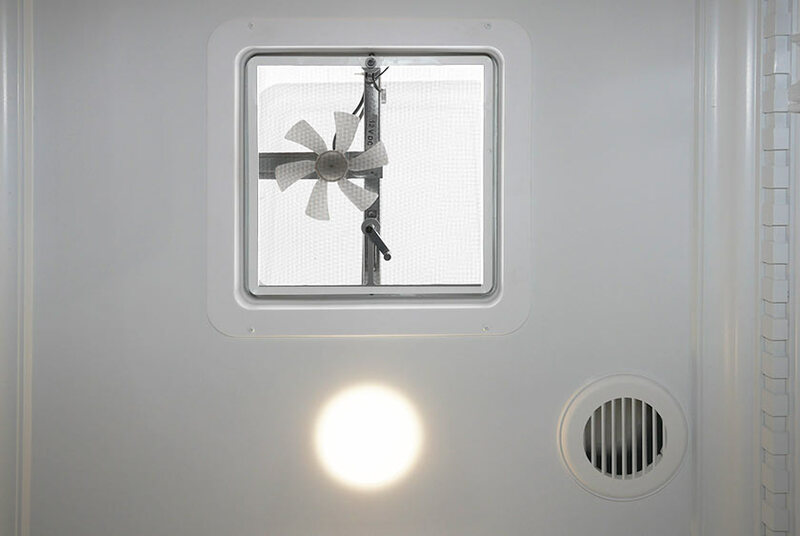 Hi-hat ceiling lights supply guests plenty of light inside the trailer. 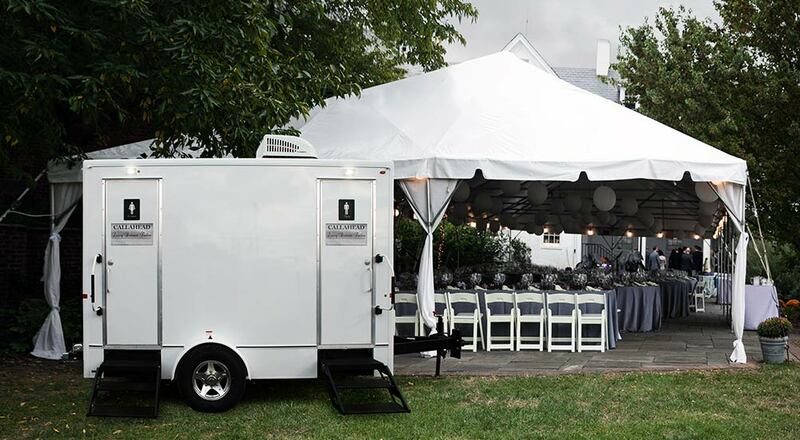 When searching for the best restroom facilities for your event, don’t take chances. 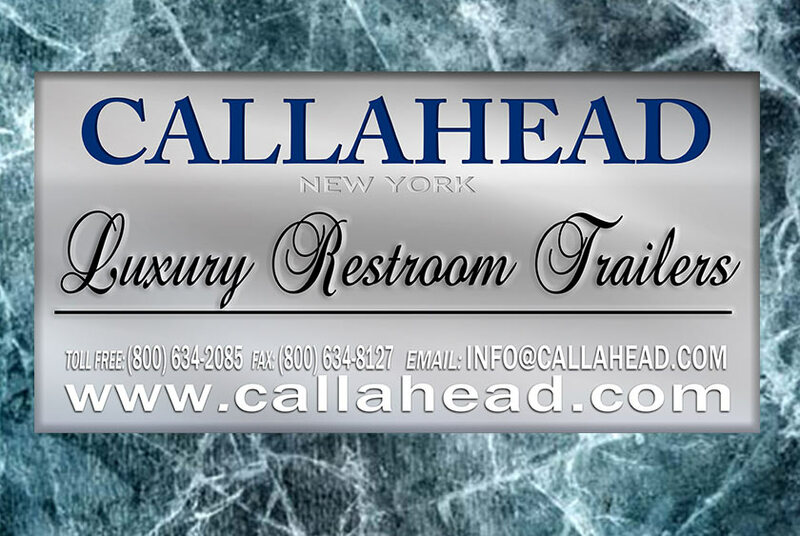 Only CALLAHEAD has the dedication, experience, and equipment always to deliver the world’s best portable sanitation equipment to fulfill all your portable restroom needs. 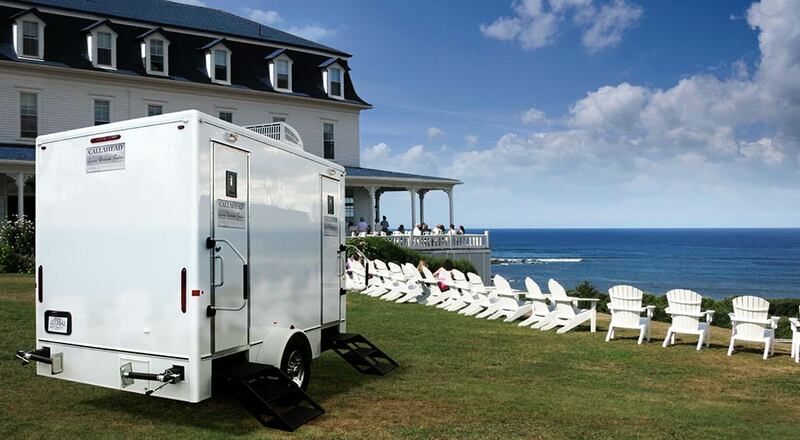 For more information about the ROSECLIFF LUXURY RESTROOM TRAILER or any of CALLAHEAD’s equipment, including construction restroom trailers, VIP portable toilets, standard portable toilets, portable sinks, porcelain toilet systems for office trailers, guard booth and ticket booth rentals, portable storage sheds, holding tanks, fresh water delivery, commercial portable sinks, portable hand washing sinks, portable antibacterial and hand sanitizing rentals, long-term or short-term portable toilet rentals, long-term or short-term restroom trailer rentals, portable shower and bathroom rentals please contact one of our expert sales specialists at 800-634-2085 or visit our website for full details of all of our equipment at www.callahead.com. 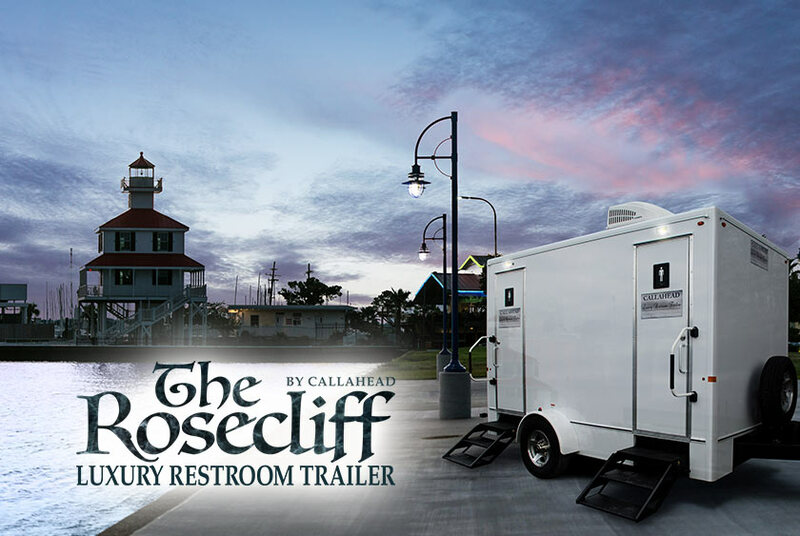 CALLAHEAD’s 3-station luxury restroom trailer, the ROSECLIFF was designed by the award-winning builder and President and CEO of CALLAHEAD, Charles W. Howard. 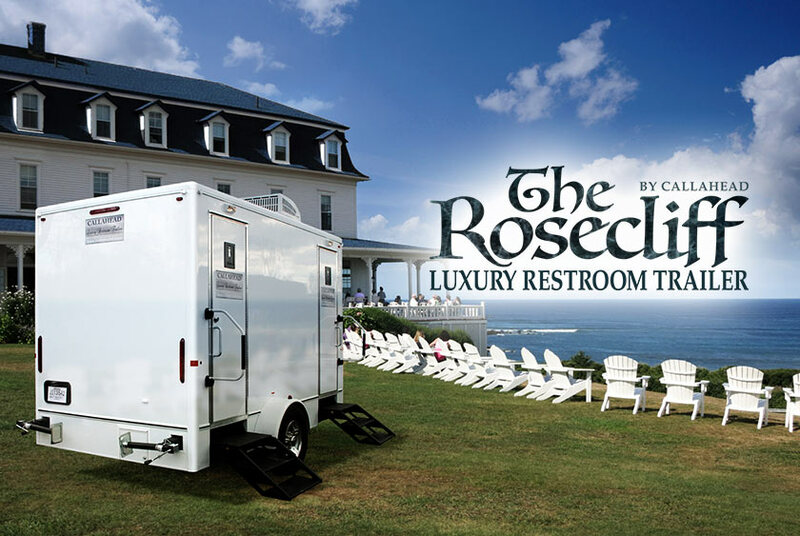 The ROSECLIFF Luxury Restroom Trailer is a CALLAHEAD exclusive for special events and short-term rental and unavailable anywhere else. 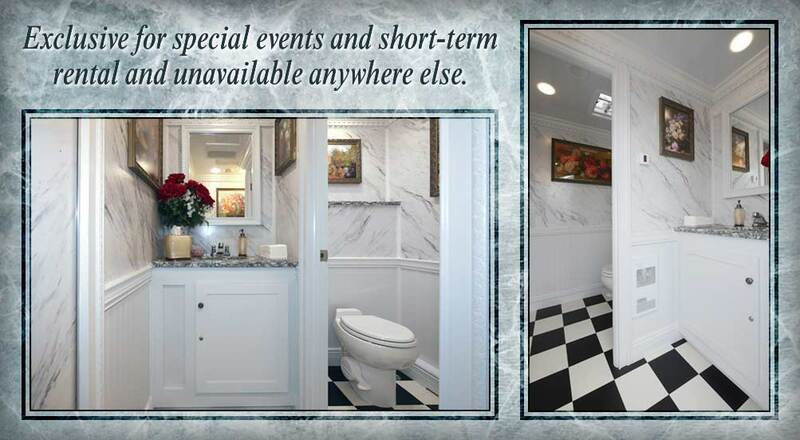 Opulently designed separate women’s and men’s bathrooms will impress every guest at your event. 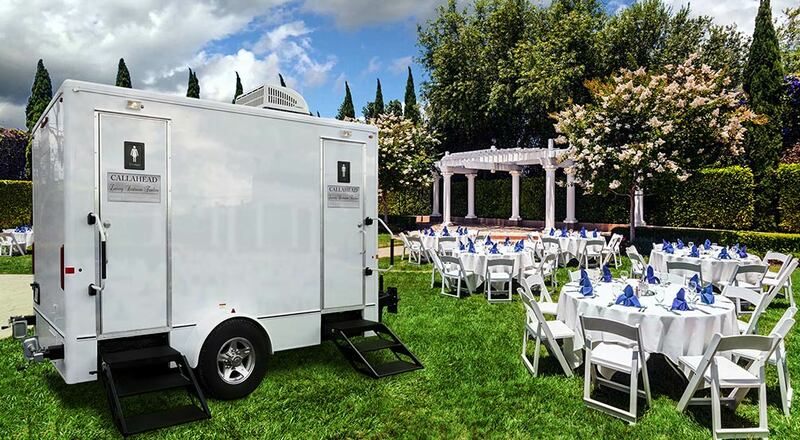 From formal weddings to small social gatherings, the ROSECLIFF Luxury Restroom Trailer is elegantly designed and delivers the cleanest restroom facilities in the industry. 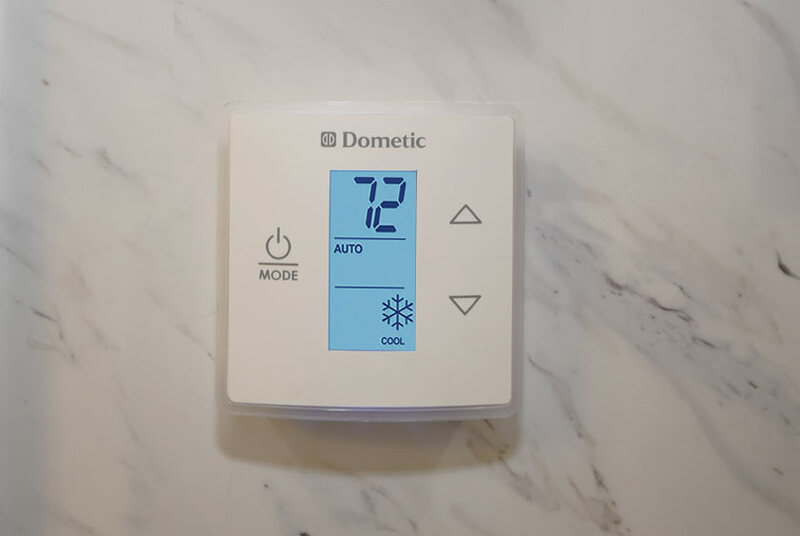 With thermostat heat and air conditioning to ensure guaranteed comfort inside the restroom any time of year. 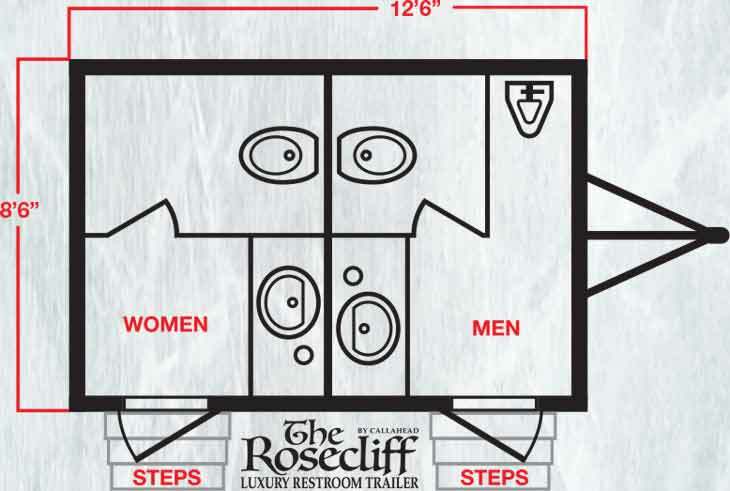 Once inside the ROSECLIFF Luxury Restroom Trailer users will be overwhelmed by the exquisite architectural details of the interiors design. 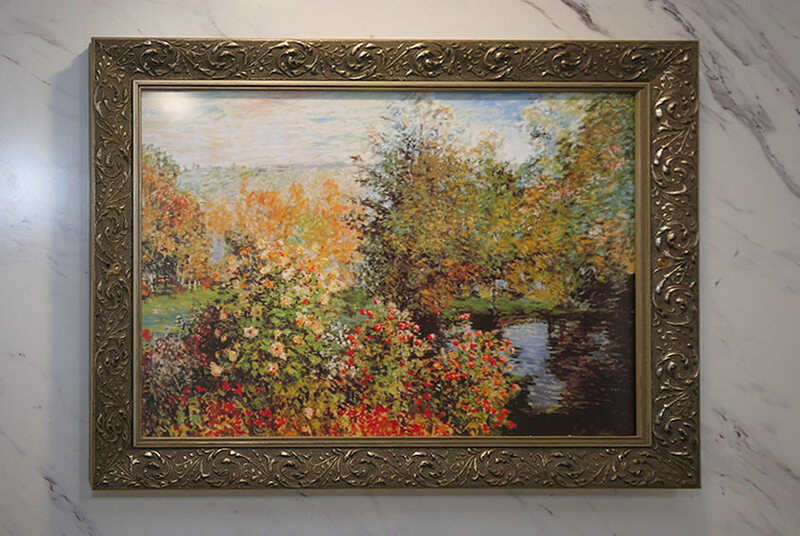 Gorgeous custom framed artwork decorates the walls throughout the men’s and women’s restrooms. 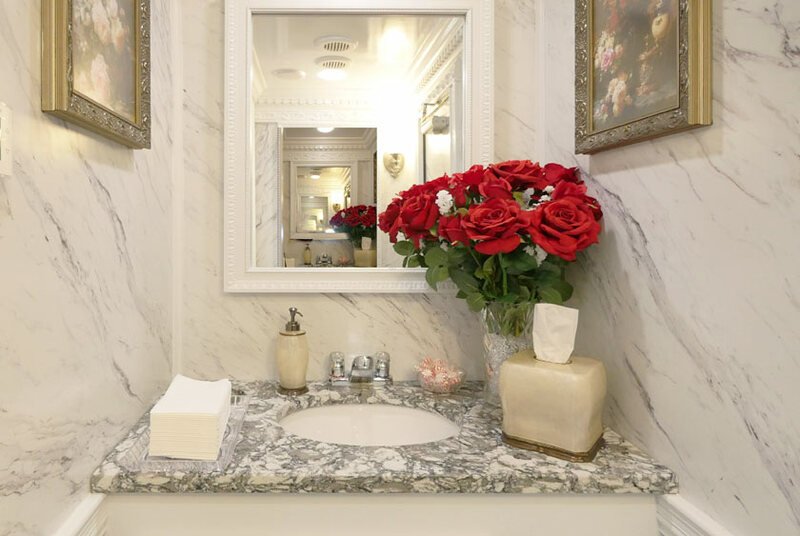 The vanity areas include a porcelain sink basin, filled antibacterial soap dispenser, hand towels, candy dish and vanity mirror for a luxurious restroom experience. 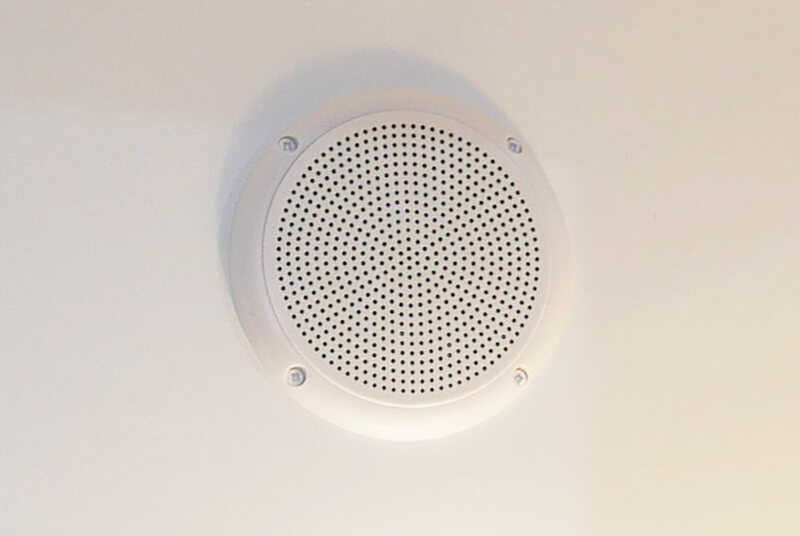 Thermostat heat and air conditioning and the surround sound music system will add to the pleasant visit to the bathroom. 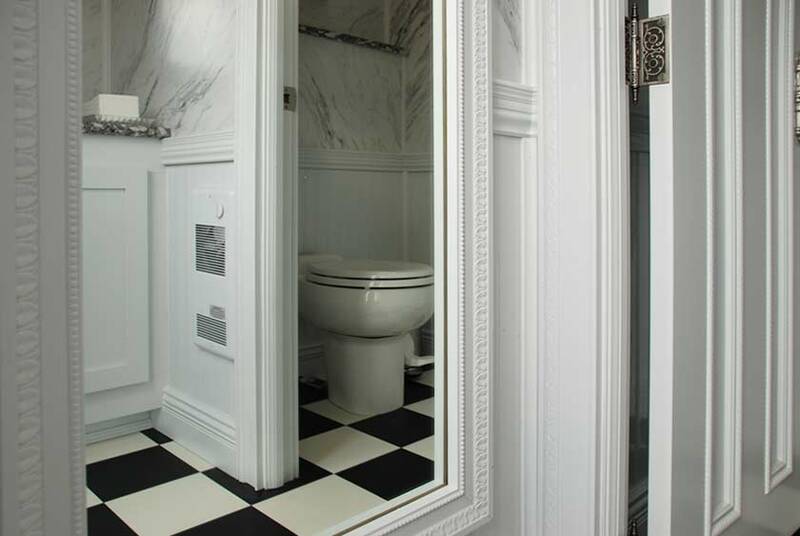 Both restrooms have extra-large private bathroom stalls with floor to ceiling lockable doors. A Sloan porcelain waterless urinal is also available inside the men’s restroom.